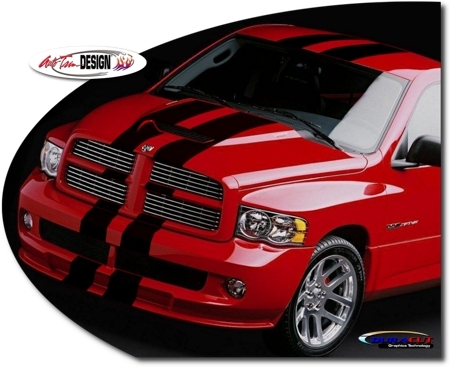 Reminiscent of Dodge's popular Super Sport Truck (SS/T), make your '94-'08 Dodge Ram Truck "Tough-looking" with this awesome Rally Stripe graphics kit. This easy-to-install kit is packaged as a set PRECUT pieces ready to install in a wide variety of colors - NO TRIMMING required! This stripe package is not just a set of 10.875" (27.62cm) strips in a box. Our graphic kit consists of prefitted and contoured pieces as shown in the illustration. 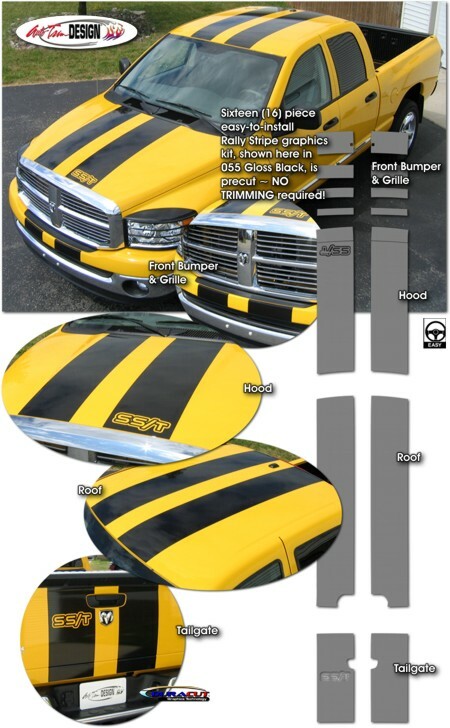 Kit is specifically made for the '94-'08 Dodge Ram Truck factory bumper, grille (grille pieces not shown on chrome grille in image) hood, roof and tailgate areas and will not fit any other vehicle. Select from two (2) vehicle models - Regular or Club/Quad Cab trucks - and two (2) badging styles - Solid or SS/T. Rally stripes are set for 6" (15.24cm) center spacing at time of installation. Trimmable Spoiler Kit #ATD-DDGERAMGRPH59 consists of two (2) pieces 22" (55.88cm) in length by 11.285" (28.66cm) in width that can be trimmed during installation for custom spoiler applications.